In this archive you will find all the stories that have been issued by GATE partners across Europe over the life of the project. If you have information you would like to add to the archive, please contact your regional GATE co-ordinator. Research carried out by GATE partners at Ljubljana University into the current public perception of wooden buildings in Slovenia. Details are in Slovenian but results and summary are in English. Winners announced. Click below for further details. The winner of the Student Design Competition in Wales has been announced. Arwel Owen, a CAD Technician from Machynlleth, Powys, Wales put forward an excellent design for a proposed holiday chalet development. It's a predominantly timber frame design, incorporating sustainability through the use of renewable sourced timber from locally managed forests. Click below to see more details, plans and 3D views. The national project part found with the jury-meeting on 8.11.2006 at the FH Erfurt (University of Applied Sciences) and with the appreciation of the winners on 15.11.2006 in the context of the annual convention of the IFF Weimar its formal conclusion. Now we have 3 winners and 3 students achieved recognitions. (see also Case study 5). At the end of 2006 we could extend our travel exhibition. Now we can show modern timber constructions on 11 big posters. The next and last poster will show the results of the students design competition. (Pictures will follow. Estonian Forest Industries Association, Estonian Academy of Arts and GATE Estonian Partner Tartu Science Park Foundation organized this workshop for students who study architecture. A series of small gatherings of GATE partners and stakeholders to look at the content and organisation of the Inter-Regional seminars. Click below to see reports and photographs from meetings in Poland, Estonia, Slovenia and Germany. With effect from 3rd January 2006, Mike Over has taken over from Anne Roberts as the GATE Project Manager. Anne is currently on a years maternity leave following the birth of her baby girl, Hazel Katrina. The enhanced version of the GATE website was launched to on 26th August 2005. This now gives the GATE project partners the ability to easily manage the content of the website by adding and editing their own information. For the interested public there is a library of images, reports and case studies of relevant building projects. Project partners also have access to a private area of the site, including chat and discussion forums. The website is constantly growing with new material being added every week. Help make this website practical and useful to you by suggesting extra links or information we can add. Wales is leading a five nation challenge to put timber at the top of the tree as a major player in the modern building and construction industry. A new three-year European funded project, GATE - gaining added value for timber in europe - has put changing the perception of timber as a building material at the top of its agenda after its international launch on 21 April at the National Library of Wales, Aberystwyth. "We have to prove to the construction industry and policy makers across Europe that timber is a modern building material that can cut construction times and increase design flexibility," said GATE programme manager Anne Roberts. "It can also provide major energy conservation and sustainability benefits, and is a cost-effective alternative to other building methods," she said. The two-day GATE conference took in visits to see how timber is already being used in construction throughout Wales in exciting new ways with delegates from the four other partner regions - Thuringia in Germany; Pomerania in Poland; Slovenia and Estonia - touring award-winning buildings in the Swansea area. "Our objective is to change perceptions, we want timber to be top of the list when architects, designers and planners think about how they are going to construct their next buildings," said Anne." And by working together across the five partner regions, sharing our knowledge, information, new ideas and technical expertise we believe that in three years time we shall have done just that," she added. Fears over fire are one of the main misconceptions that make planners and architects keep to traditional building techniques rather than switching to time-saving timber construction. That's one of the findings from a new Forestry Commission Wales led five-nation project which aims to make timber a major player in the modern building and construction industry. Now the new three-year European funded project, GATE - gaining added value for timber in europe - is holding a special conference in Tallinn, Estonia to highlight the safety record of the world's oldest building material. 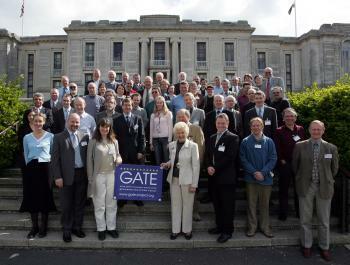 The opening conference of the GATE project was held in Aberystwyth on 20-21 April 2005. Over 60 delegates attended from the various partner organisations, plus many guests. A great time was had by all.